Kidney stones are rock-like accumulations that form from naturally occurring mineral salts in the urine that can become lodged in a kidney or ureter (kidney tube). Left untreated, stones that block the flow of urine can lead to serious complications, including recurrent urinary tract infections and kidney damage. In many cases, recurrence of kidney stones can be prevented by simple lifestyle changes, such as drinking more fluids or changing one’s diet. Kidney stones are rock-like accumulations that form from naturally occurring mineral salts in the urine. 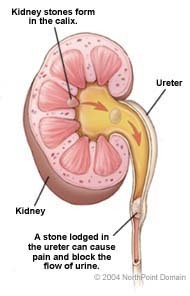 Urinary stones most often form in the kidneys and for this reason are sometimes referred to as kidney stones. However, urinary stones (or calculi) are more accurately classified according to where they are first discovered-in the kidneys, ureter (kidney tube), or bladder. A burning sensation during urination or blood in the urine. 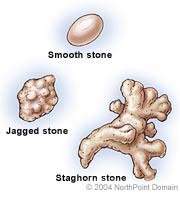 Calcium stones: The most common form, calcium stones occur when there is too much calcium and/or oxalate in the blood. Taking certain drugs or too much vitamin D can increase calcium concentrations. Genetics or a diet high in oxalate-rich foods such as spinach can elevate oxalate levels. Struvite stones: Struvite stones are created by bacteria that infect the urinary tract and usually appear in women. Most stones are discovered only after they cause symptoms. The physician will start with a physical examination to rule out other serious conditions, such as acute appendicitis. A urinalysis test is also performed to determine if any infection or blood is present. The physician will ask a number of questions about medical history and lifestyle habits like diet and exercise as well. X ray: A traditional x ray showing the pelvic area, kidneys, and bladder is sometimes sufficient to locate urinary stones. Intravenous pyelogram: For this type of x ray, a medical dye is injected into the bloodstream to provide visual contrast on the x ray, allowing the physician to clearly see the stone and assess the degree of obstruction. Computerized tomography (CT) scan: The CT scan provides high-resolution x rays and can assess stone location and degree of obstruction without the need for intravenous contrast dyes. Most small stones eventually exit the body on their own. For this reason, a patient with small stones is usually prescribed pain medication and is instructed to drink as much fluid as possible to help flush out the stone. Depending on the type of stone, lifestyle changes can help prevent recurrence. Most patients are advised to drink large amounts of water-more than 14 cups a day. Since high intakes of fish, beef, or poultry can cause stones, a diet low in animal protein may also be recommended.